Online Government job applications are invited from all Indian candidates who are looking for a Government job in India. 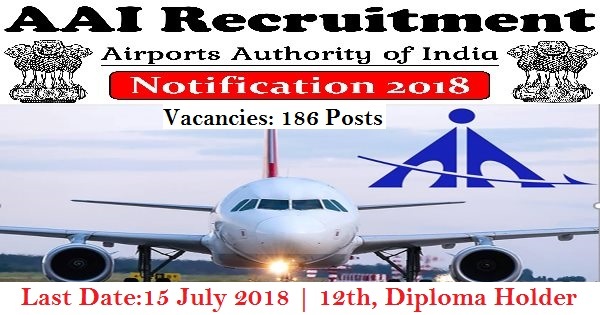 Airport Authority of India (AAI) is inviting online Government job application from the eligible candidates who are domicile of Tamil Nadu, Andhra Pradesh, Telangana, Karnataka, Kerala, Pondicherry or Lakshadweep islands to fill up the following posts at various airports in the above states in Southern Region. There are 150+ vacant positions which are going to filling up through this AAI Recruitment process 2018. Candidates shall apply for the below mentioned posts through online application link hosted in AAI Career pages of our website i.e., https://www.aai.aero/en/careers/recruitment . 10th pass and diploma Holder can apply for these airport jobs to make AAI Career as an officer. The procedure for applying these Airport jobs in India will starts on 16th June 2018 and can apply up to 16th July 2018. AAI Recruitment department going to select candidates on the basis of computer based test for these Airport jobs. More detail about these Government jobs in India through AAI Recruitment process is given below in this post. Read it carefully before applying these Airport jobs 2018. What are the various Eligibility Criteria for applying this AAI Recruitment? After knowing about this AAI Recruitment this is the very common question among the students. The answer of this question we explained below in the table related to the eligibility criteria required for these Airport jobs in India 2018. Those who want to make an AAI Career must satisfy the following eligibility criteria explained below in the table. Those who pass 12th class with 50% marks and Valid Heavy Vehicle Driving License can apply these airport jobs. The candidates must fall in the flowing eligibility criteria of age 18 years to 30 years for applying this AAI Recruitment 2018 to make an AAI Career. Diploma holder in one of the following trade: “Electronics / Tele Communication / Radio Engineering” from a recognized institution can apply for these airport jobs. What is the Application Fee for applying this AAI Career making opportunity? Those who want to apply this AAI Recruitment can pay the fee from the following ways: “Internet Banking/Debit/Credit Card only”. What is the Selection process for applying these Airport Jobs? Applicants will be selected on the basis of their performance in the written examination. The written examination will be online and Computer based examination. Those who clear this written examination round will call for the personal interview round for final selection. Those who are wishing to make AAI Career can apply for this AAI Recruitment through online process. Candidates we advise you to follow the online official website for applying online. Beware of the fake and scam websites. We also share the link below under IMPORTANT Link section related to this AAI Recruitment 2018. 15th July 2018 is the Last date for applying.